A 10 days South India photo tour to Kerala and two exceptional extensions: a pre-trip Varanasi stay and a post tour incredible "special" Lathmar Holi experience with the visit to the Taj Mahal. More than 20 years visiting india year after year. Good boutique hotels, great food. The night Fire Theyyam and Elephant Festivals with a fascinating exploration on our own deluxe house boats ending at the Kerala Backwaters. On the Varanasi 5 days Optional Extension we will get to know a different city to the one other tourists see. With time to enjoy our stay in contrast to the hustle and bustle of Shamans, boatmen, pilgrims, cows, tourists, barbers, and fake Sadhus. We will cross to the other side of the river where no one normally goes, to admire the city from another perspective and witness the daily coming and going of pilgrims. We will stroll though the back streets of the ghats, the alleys, and discover temples outside the normal tourist route. We will meet people there, and wait for the certainty of the unexpected to happen. Please visit my personal work on Varanasi as well as some posts on my Varanasi at dawn. This is where I took in 2012 the picture that won and later lost the National Geographic Photo World Contest. - Our photographic coverage of the night fireTheyyam dance which may last the whole night. - Get the chance to photograph the slums of Mumbai´s Dharavi district. - The Elephant festival, led by throngs of drummers and whirling dancers. - Get the incredible luxury of Kerala´s viridian hills and plantations, and visit the villages in Cochin. - Our private Kathakali performance in the theatre. From the makeup and the dressing rooms to the performance itself, we will have a chance to photograph the dancers at all stages of the event. - The enjoyement of photography with intensity accompanied by a professional travel photographer that understands the secrets of Varanasi (Optional Extension). The hidden locations. -Our daily life in Varanasi (Optional Extension), staying beside the Ganges, in contact with the people of our Gaht: pilgrims, barbers, flower salesmen, boatmen, Holy Men and the occasional tourist. Our photographic adventure starts in Mumbai, with a dedicated visit the Daravi Slum, an incredible alternative city. Later we will head south to see two of the most incredible and singular photographic opportunities on the planet: the rite of Theyyam and the Kerala Elephant Festival. Theyyam, the God’s Dance, where performers in folds of heavy red and white and gold fabric perform a rite that is several thousand years old, is a world of color and life. We will spend two days exploring the world of bhoota spirits and the rich history of the southern provinces as we document this unique and age old tradition with our cameras. Then we are off to the Elephant festival, where many great beasts bedecked with beads and ribbons and intricate headpieces parade through the towns to the temples of worship, led by throngs of drummers and gaily whirling dancers. Cochin has origins as far back as the Roman times, and is noted as the oldest European outpost in India. It still maintains a small but beautiful Jewish Quarter and a busy spice market, it has an interesting blend of varying architectural and religious influences. We will end the first part our expedition visiting the green, tranquil province of Kerala to the south – one of our favorite destinations in India. It has a peaceful and relaxed ambiance compared to the rest of the country. From impressive network of waterways along the Malabar Coast to the expanse of lakes and lagoons that make up the Backwaters, you can find rolling viridian country dotted with spice and tea plantations. As a very special Optional Pre-Tour Extension we will head towards Varanasi. Our days will be really busy reaching the Ghats to photograph, amongst remains of wreaths and cremation ashes, Brahmins offering ritual shaving, dressed bathing women. Bearded, hirsute Holy Men, bare feet, watching stunned families bathing dressed in bright Indian saris. Groups of pilgrims down the huge wooden barges. Then the calm of our hotel, close to the Ganges, attending dinner before the night ceremony. In the calm of "our" Ganges. We will go down the sacred river in our boat and visit an “akhara”, a gymnasium where Kursty fighters train and compete. If we are lucky we will be able to make a photo coverage of their workouts. As a Post-Tour Optional Extension we will visit the Lathmar Holi and later the Taj Mahal. This is a very special and unique "advanced" Holi festival, that takes place in a series of villages in India.It takes place days before the actual Holi in the neighbouring towns of Barsana and Nandgaon near Mathura in the state of Uttar Pradesh, where thousands of Hindus and tourists congregate, each year. Arrival to Mumbai airport. On arrival, transfer to hotel and check-in. Afternoon introductory briefing and first exploration of the city. We will expend our time on a truly mind blowing tour of the Dharavi Slums and the Dabawalas. So different from the newer downtown areas of the city, these places are very interesting for capturing the other side of Mumbai´s cultural coin, so to speak, and we will have plenty of time to work on photographing the ambiance here effectively. We will also stop for a planned photo opportunity at Dhobhi Ghat or Laundry. Today we will fly from Mumbai to Calicut and then drive to Kannur, which is in the southern Kerala province. On this night, depending on the schedule, we will attend and photograph a Theyyam dance – ornate red and white costumes covered in beads and cloth make the men with faces painted red and startling, look like crested, towering creatures of myth as they perform this ancient, several millennia old ritual that is integral to how their people view the world. The dance may last the entire evening and well into the night. We will get a late start in the morning, letting us relax after our late night, and then head out to see some of the Theyyam practices by daylight, as well as lay on the beach, or explore some of the nearby fishing villages. 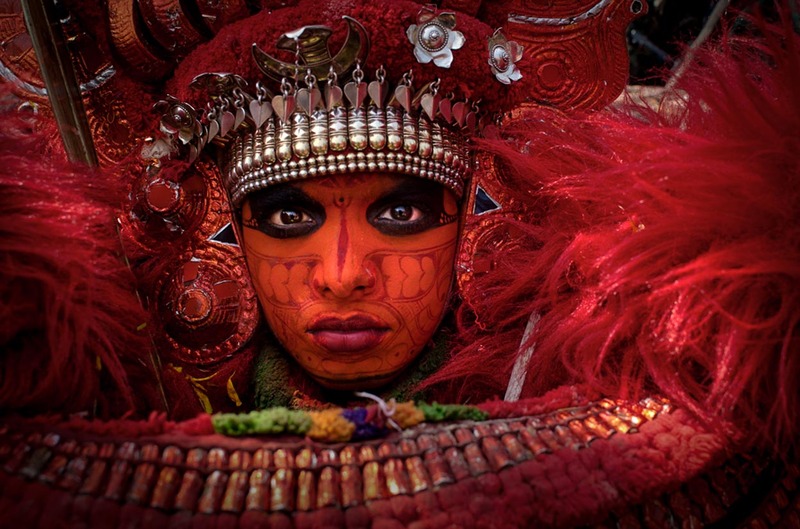 Theyyam is a type of ritual worship that dates back at least 6 millennia in this area of India. It is more than simply a dance: some treat the entire rite of Theyyam as a personification of God in and of itself, and so, the so called God’s Dance is a living religious icon, with many facets and touches many different aspects for life and spiritual belief. It centers around a person called Kolam, which means figure in make-up, and the Kolam is meant to represent the deity. In the northern part of the province, Theyyam is a way to worship spirits called Bhootas, and the dance is conducted in places where Bhootas are or used to be prevalent. After a day of exploring the world of Theyyam and its practitioners, we will have a late evening visiting a local temple, where we will have time to capture another dance with our cameras. After an early but not too early breakfast, we will drive a few hours out to Cheruthuruthy, to see the Elephant Festival. We will check into the hotel upon arrival. Ayyamkulangara Kanipayyur is the local word for the Elephant Festival, which is frankly speaking, a photographic dream come true. Colorfully decorated Elephants wear ribbons and tassels, brightly dyed cloth and beads, parade through the town to the temples, carrying effigies of deities on their backs while gaily dressed drummers and dancers swirl at their feet, leading them along the road to worship. We will spend all day at the elephant festival, with some scheduled shoots, but mostly, as the festival is so lively and ever changing, this will be a day of more spontaneous photography. We will return to the hotel at night. After breakfast we will head out to see the Kalamandalam School of Dance for a scheduled photo shoot. The school was founded by the famous poet Padmabhooshan Vallathol Narayana Menon. It has become an important and universally known name in India, renowned for preserving cultural heritage. It is a residential school, and though the structure itself is not overly ornate, the performances inside the simple classrooms are astounding. We will have a guided tour of the classes and time to interact and photograph some of the dancer students and teachers. After our photo session we will head to Cochin, and arrive in the early evening. After check in at our hotel we will go out just before sunset for a boat cruise to see the chinese fishing nets being hauled in just as the sun sinks below the horizon. We have hand selected the spot so they we will have the best possible shots of the fishermen and the atmosphere. Early in the morning we will head out to photograph fishermen in the harbor, again taking in the Chinese fishing nets at sunrise, then on to the fish market, the colorful and photogenic local laundry, and a few other surprises on the streets along the way. We will also take time out today to visit a Jewish synagogue, a Dutch Palace, and the Vasco D’ Gama Church, with ample time to photograph the architecture and learn about the region´s culture. Later in the afternoon we will go to see, and photograph a Kathakali performance in the theatre. From the makeup and the dressing rooms to the performance itself, we will have a chance to photograph the dancers at all stages of the event. After breakfast, we will drive to Alleppey, the boarding point for the houseboat that will take us through the backwaters of Kerala. We will have private houseboat with your own cook and staff. Once we reach Muhamma we will visit the village market and see some coir making. Then, the cruise will proceed to Pathiramanel and anchor for overnight stay. Alleppey is a small town situated in the Backwaters of Kerala, and it is the ideal place to start a cruise along the winding waterways, lakes and canals of this peaceful area. There is a long stretch of beach to wander along and several interesting small churches to visit. The romantic and unique Backwaters of Kerala are made up of a labyrinth of canals and lakes that stretch between the capital Cochin and the town of Quilon to the south. From the vastness of Lake Vembanad to the quiet streams just large enough for a canoe, the Backwaters form the arteries through which rural daily life calmly flows – you will get the chance to capture with your camera the tranquility of life here; children splashing in the water, women washing clothes at the water's edge, fishermen up to their necks in water digging out fish with their feet, rice barges transporting coconuts and rice and of course the stunning backdrop of lush forest reflecting green off the river as our boat sails calmly by. We will slowly return on our boats to Allepey and from there to Cochin. Those who end the trip here will be transferred to the airport. The rest will head towards Mahabalipuram on the optional Extension. IMPORTANT: THE PRE-TOUR OPTIONAL EXTENSION IS TAKING PLACE BEFORE THE MAIN ITINERARY . We will get to know a different city to the one other tourists see. With time to enjoy our stay in contrast to the hustle and bustle of Shamans, boatmen, pilgrims, cows, tourists, barbers, and fake Sadhus. We will cross to the other side of the river where no one normally goes, to admire the city from another perspective and witness the daily coming and going of pilgrims. We will stroll though the back streets of the ghats, the alleys, and discover temples outside the normal tourist route. We will meet people there, and wait for the certainty of the unexpected to happen. During our incredible stay in Varanasi, our days will be really busy reaching the Ghats to photograph, amongst remains of wreaths and cremation ashes, Brahmins offering ritual shaving, dressed bathing women. Bearded, hirsute Holy Men, bare feet, watching stunned families bathing dressed in bright Indian saris. Groups of pilgrims down the huge wooden barges. Then the calm of our hotel, close to the Ganges, attending dinner before the night ceremony. In the calm of "our" Ganges. We will go down the sacred river in our boat and visit an “akhara”, a gymnasium where Kursty fighters train and compete. If we are lucky we will be able to make a photo coverage of their workouts. In Varanasi I always choose to stay in one of the few excelent boutique hotels next to where the action is: the Ganges. Tourists are usually sent to the Cantonement area where international hotel chains are based, a good 40 minutes away from the Ganges on peak hours. In Varanasi, my choice is staying in a Hotel 5 minutes away from the photographic locations. When we have an early start - at 5:30 AM- it's great to save 35 minutes of sleep! This is not the average Holi that you know. The Lath Mar Holi is a very special and unique "advanced" Holi festival, that takes place in a series of villages in India. Very special traditions at very special places. At Lath Mar Holi we will be really close (and we will be part of the show) to the people “playing Holi”, in both towns of Nandagaon and Barsana taking our pictures and we will cheer on the friends of Krishna or the friends of Radha during the “battle” of as they shower the town with colors in a festival that is a photographer’s dream come true. It takes place days before the actual Holi in the neighbouring towns of Barsana and Nandgaon near Mathura in the state of Uttar Pradesh, where thousands of Hindus and tourists congregate, each year. Thousands gather to witness the Lathmar holi when women beat up men with sticks (laṭh or lāṭhī) as those on the sidelines become hysterical, sing Holi Songs and shout Sri Radhey or Sri Krishna. The women of Barsana start preparing a month in advance. The mothers-in-law feed their daughters-in-law rich food so that they show off their prowess on the Holi battle zone. It is a show of love, fun and equality. On the first day of Lathmar Holi, gops (shepherds) from Nandgaon come to Barsana to play Holi with the gopis (shepherdesses) of Barsana. The festival begins with a ceremony at the Radha Rani temple. After this ceremony gops then march out of the temple on the Rang Rangeeli Gali where they stop to play holi with the gopis, who stand in groups along the street. The second day gops from Barsana go to Nandgaon to play holi with gopis at Nandgaon. The maximum number of participants are listed under "Maximum Group" in the Price section of each individual workshop. However, we reserve the right to add by up to two , the maximum number of participants per workshop at any time. -All Meals, excepted the first and the last day. -Gratuities: baggage porterage, driver and assistant, housekeeping and meals served as part of the tour. The fees do not include the customary gratuity for your guide on the main itinerary and the optional extension. -Transfers on arrival and departure. -Lodging 1st class hotel in Mumbai and Excellent local and boutique hotels elsewhere, double room, double occupancy. Private bath and air conditioned. -De luxe houseboats on the Kerala Backwaters. Air conditioned. Private cook. -Gratuity for the guides on the main itinerary and the optional extension. -Any item or service not expressly defined as included.